* To address any equality or diversity concerns regarding the title of this recipe being construed as sexist, parent-ist or some other kind of -ist: This fudge is actually suitable for anyone (well, maybe not children), not just dads (great news for everyone else!). But let’s be honest, there are only so many pairs of novelty socks your dad’s going to thank you for. 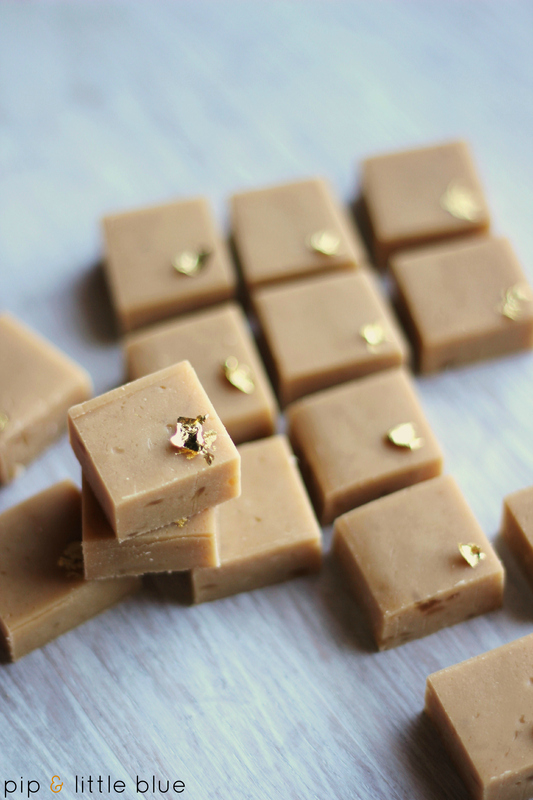 So here’s another fudge recipe to delight the senses. Live on the wild side and make it without a sugar thermometer. I dare you. 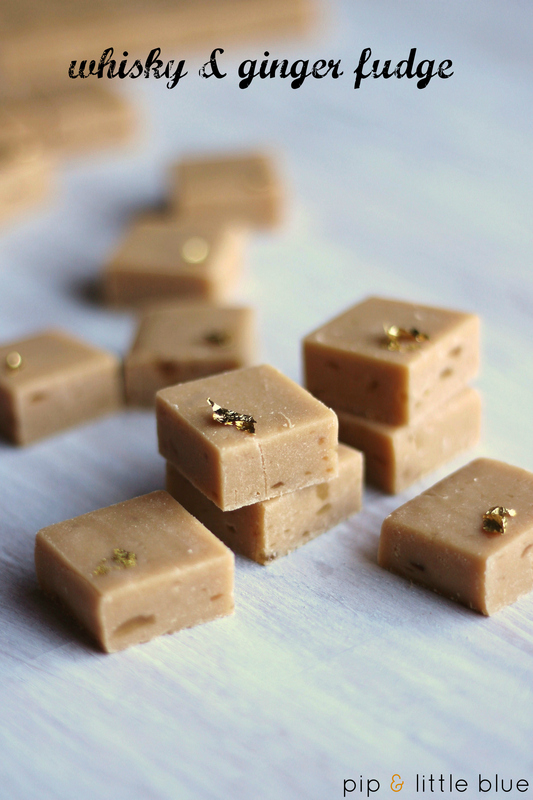 This soft, creamy fudge has stem ginger running through it and the hint of whisky adds a lovely festive warmth to proceedings. Ho ho ho. Line a 20cm x 20cm square dish with greaseproof paper. In a large saucepan on a medium heat, heat the condensed milk, milk, butter and sugar, stirring regularly, until the sugar has melted. Turn up the heat, add the whisky and bring to the boil. Simmer for 10-15 minutes, stirring continuously, until a small amount of mixture dropped into a glass of cold water forms a tiny ball of mixture that holds its form but is still squidgy (the ‘soft ball stage’ in geek speak). Tip: You must keep stirring otherwise the fudge will stick to the bottom of your pan and you will have burnt bitter fudge! Transfer the mixture to a bowl and beat for about 10 minutes, until the caramel-y glossiness has gone and you have a thick, soft fudg-y (funny that) consistency. About a minute before the end, add the ginger chunks. Tip: You can do all this by hand but I use the beater attachment of my food mixer on a medium-high speed for 10 minutes – much easier! Scoop into your lined dish, squidge into the corners and pat down to even the surface, and leave to cool at room temperature until firm. 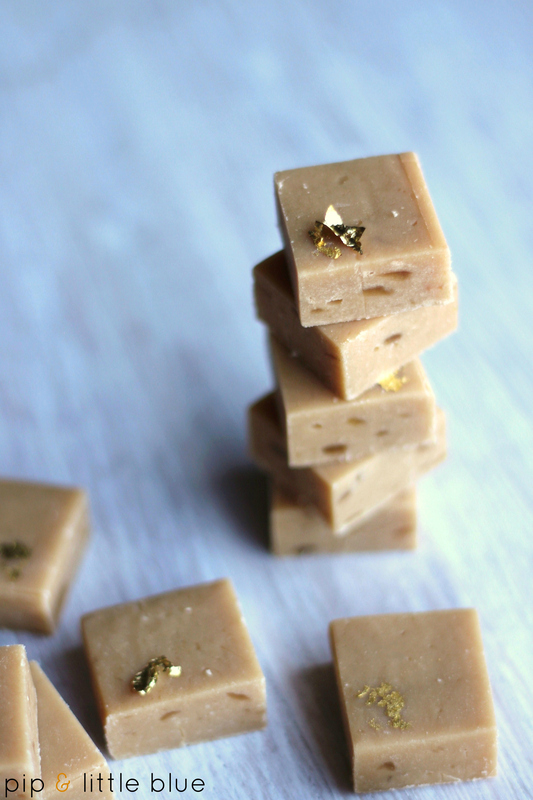 Brush with teeny bits of edible gold leaf (if using) and cut into squares. Will keep in a sealed container at room temperature for several weeks. Tags: Christmas, edible gift, fudge, ginger, gluten-free, recipe, stem ginger, sweets, whisky. Bookmark the permalink.